Whenever it starts to rain, as it often does in God’s own country aka Kerala, I run to the terrace to collect the clothes drying on the line before they can get wet. The urgency of my action transfers itself to Luci, my constant companion, follower, shadow, sticking plaster, call her what you will. The very second I push my chair back, or drop whatever I am doing and rush up the stairs, Luci is close on my heels. Naah, scratch that, ‘she has left me far behind and bounded ahead’ would be more like it. Even those times when Luci does not know where you are headed, but finds you rushing/running, she speeds up, pushing past you. That’s the time you have to watch out for or else find yourself where a certain Humpty Dumpty found himself soon after he sat on the wall as the nursery rhyme books tell us. There is one other time you have to be careful too, and that’s when you find yourself standing at a half open doorway doing something or other (plus What-iffing) and a crow alights on the wall opposite. It was sheer luck that I did not meet the fate of the Humpty Dumpty mentioned above when on just such an occasion almost a year back, all 35-40 kilograms of Luci dashed against my legs sending me and the soaked dal I had in my hand spread out in all directions on the hard ground outside the door. Imagine my plight if they had told me at the hospital, “Very sorry Ma’am. All the king’s horses and all the king’s men cannot put you together again!” Luckily, we have doctors and not king’s men and horses to put us together these days, and so a week’s rest had me back on my feet again. Anyways, getting back to the rainy days, when I run and Luci tries to run ahead she also yelps excitedly as if she is being chased. On second thoughts, the yelps sounds more like, “I’m coming too, don’t leave me behind. 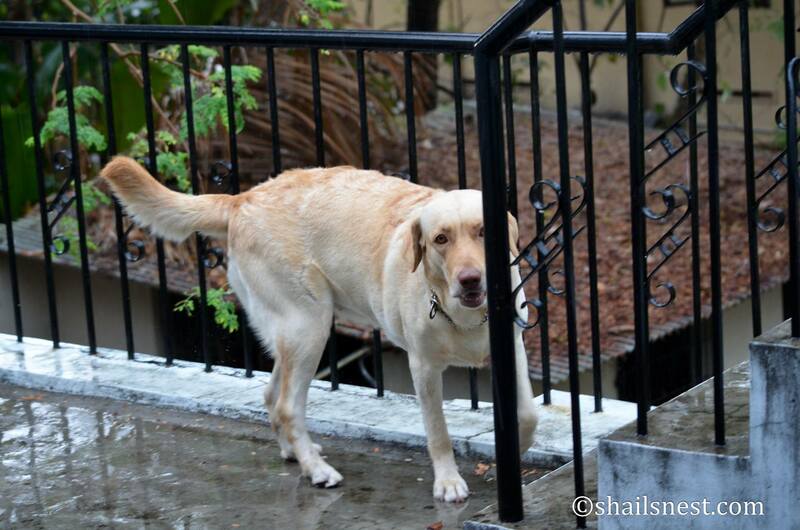 I am coming too, don’t leave me behind!” As soon as she reaches the place where there are two doors, one opening to the terrace and the other to the bedroom, she stops and gives you that typically endearing Labradorian look of confusion. Which is it going to be? You can almost hear the wheels turning in her doggie head, the size of a small pumpkin. She looks at you huffing and puffing up the stairs, impatient for an answer. When she catches on that you are headed for the terrace, she quickly wedges herself securely between you and said door. Yeah, she has this thing about always wanting to be first. Quite unlike her Momma I must say, who couldn’t care less. Well, may be just once it so happened that she, her Momma, wanted to be first, but you can rest assured that is certainly not the norm. 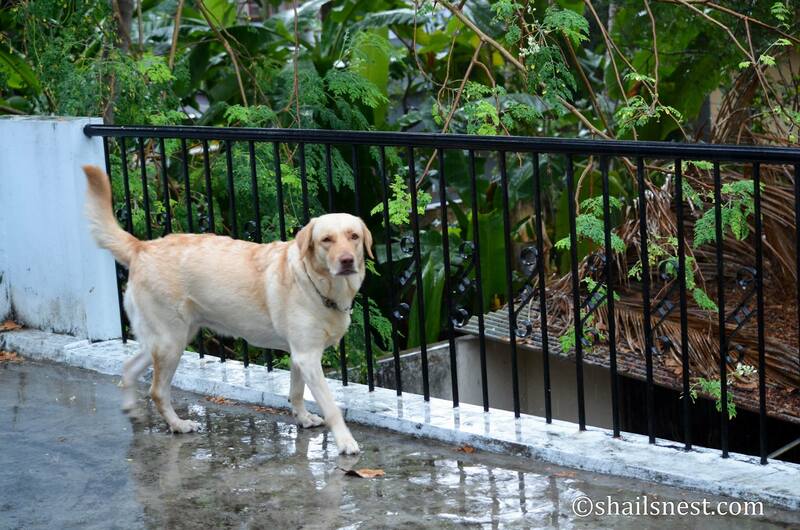 Luci has been doing this yelp-run-to-terrace thing for quite some time now, what with the monsoons being an integral (and much welcomed) part of Kerala. Once we are out on the terrace of the building, while I am busy with the clothes, she runs to the railings and peeps out to check for intruders, cats, crows and the rest; may be that pesky Rufous Treepie too, which wants a share of her Pedigree nuggets. Meanwhile the clothes having been collected, I walk back in and the Sticking Plaster Luci returns to my side. That’s our usual routine. Yesterday I am absorbed in watching the life of the giant cats on Nat Geo when an all too familiar sound registers in my mind. I turn to look out of the window. Is it raining? Indeed it is. Since there are no clothes to be take in, I just go back to TV-watching when I notice Luci rushing to the window. What’s with her? Probably a cat, I think as I find her staring intently out of the window. But Luci is soon back to me, agitated, and now stands looking at me rather beseechingly with her honey-colored eyes, insistently wagging her tail in a way that suggests she wants to convey something important to me. Eh? What is it? I wonder. The big cat program having got over on TV by then, I think a wee nap wouldn’t be such a bad idea. I start walking up the stairs when Luci shoots past me like a rocket. Weird. What is she hurrying for? There is that glint in her eyes when she turns to look at me briefly before hurrying off. Yep, you guessed it. She is standing by the door to the terrace when I reach. It has started to rain, has it not? And when it does are we not supposed to run to the terrace? That’s the ritual, the tradition we follow around here! That’s what her eyes seem to be telling me. Not wanting to disappoint her, I open the door while she quickly runs to the railings and makes herself busy checking everything is in order. Then she looks back at me proudly. See, I know what’s to be done when it starts to rain, says the look. She has to rush to the terrace and look around generally, and particularly through the railings. The ‘ritual’ over we walk back inside together, a contented dog and her amused Momma. Reblogged this on Luci the dog. LOVED THIS ONE, SHAIL! All the while, I had a big smile on my face, and a couple of tears, too! These four-legged, furry babies do that to you, don’t they? Give Luci a BIG hug from me, will you? And, also one sloppy muuaahhhh!!! oh!! Isn’t she sweet??? My mom’s cat runs to the telephone when it is ringing and then runs to my mom in panic asking ” why, why are you not picking up”? ?